It’s Sunday night and I am buried in books and journal articles, researching Greek food, tradition, culture, national identities. I take a break; I need to cook something. I was hoping today I would prepare something complicated, but my studying has been all-consuming. I haven’t even had the time to stand up to my weekly challenge, let alone read this month’s Bon Appetit! Although I am madly in love with this new discipline, I sometimes think nostalgically of those Sundays where I had nothing to do but cook. 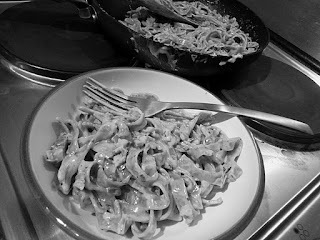 I am going through my old blog posts and even older food photos and I am amazed at how much more I used to cook. But even if things have changed, one thing has remained unchanged: my cooking routine. I pour a glass of red wine; I wear my apron; I turn on my laptop and start playing Pulp’s Common People so loud that I can’t even hear my own voice singing; I prepare my wooden chopping board and my chef’s knife. Everything is in place. I choose my ingredients. Today, I need onions and garlic. I start chopping, always trying to perfect my technique while thinking of Chef Alex’s words “You need to sit up straight! And be careful of your fingers, we don’t want a bloody mess”. I think of the first time I ever cooked, with my mother by my side, making a Greek walnut cake and discovering a new sense of accomplishment that was somehow superior to getting a good grade at school. I remember my large one bedroom flat in Edinburgh in 2007; its spacious kitchen; being so in love and in so much pain, finding relief in cooking and in discovering new tastes, flavours and smells. I think of the first Christmas dinner we hosted with Mr N in 2009, feeling exhausted, proud, independent. I remember my first house in the city center of Athens in 2010, cooking every day and taking photos, my eyes sparkling because for the first time I was making plans to change everything. I now dance and sing while I stir the onion and garlic in the frying pan, adding bacon cubes. “Sing along with the common people, sing along and it might just get you through, laugh along with the common people, laugh along even though they're laughing at you, and the stupid things that you do”. I fill a pot with water. As the water starts boiling, the remembrance of repasts fades away. I look around and I am in my new warm studio in London. It is now 2012. I add the basil pasta my sister bought for me in a small Greek village, thinking if this qualifies as “traditional food” -the all consuming studying I mentioned before. I stir in the double cream, black pepper and parsley and turn off the heat, leaving the pan to simmer just a bit longer. Even though many years and kitchens have passed since the first time I poured a glass of red wine and chose Pulp to accompany me in my culinary adventures, this routine has remained unchanged. It is strange how food, not only in the sense of taste or smell, but also the mere process of cooking, the practices, how it all comes together and forms part of a magical experience that travels through time and space and goes beyond forgetting and beyond remembering.